Organised by Skills Development Scotland (SDS), the campaign highlights the commitment of businesses who have decided to invest in the skills of their workforce. SDS wants businesses, industry, colleges, councils, training providers and those with a shared interest in the success of the apprenticeships to back the week and encourage many more employers to take on apprentices. 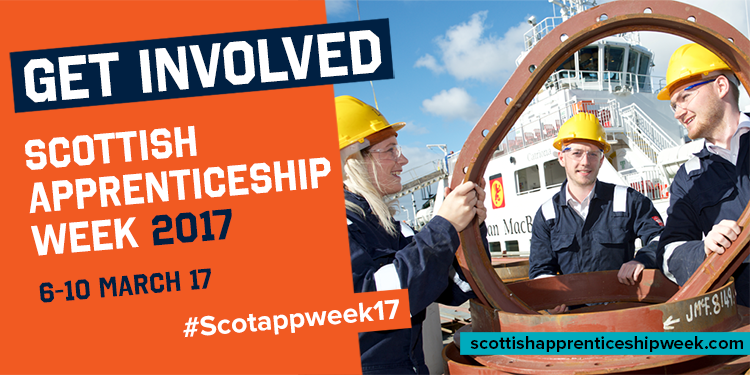 For further information about Scottish Apprenticeship Week 2017, email scotapprenticeweek@sds.co.uk or call 0141 285 6171. Moray’s Modern Apprenticeship Week is being organised by DYW (Developing the Young Workforce) Moray partners, an industry led board which aims to reduce youth unemployment by creating stronger links between business and education. They have organised a number of events to be held on Wednesday, 8th March 2017. Guest speakers from industry will talk about the new Foundation Apprenticeship programme and advisors from Skills Development Scotland will be on hand to provide guidance on the different types of apprenticeships available, the benefits to business, the funding available and how the process works. This event is exclusively for employers who already employ, or who are looking to employ Modern Apprentices. Information and advice will be available from local employers, training providers and SDS Careers Information Advice and Guidance service based in all schools across Moray. There is no requirement to reserve a space – this is a drop in session, open to all.